Cube about 1/4 lb of smoked ham into 1/4inch pieces. 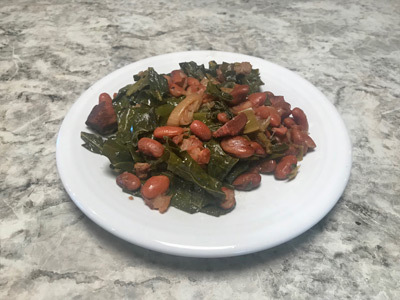 In a crock pot add 1 cup of dry pinto beans, 1 bunch of collard greens cut into 1 inch ribbons, 1 pint of chicken or vegetable stock, 1 cup of water, 1 clove of diced garlic, and 1/2 cup green onions, whites and greens, finely chopped. Cook on low for 6 hours. Chop or shred 4 cups of cooked chicken, and add to a large bowl. 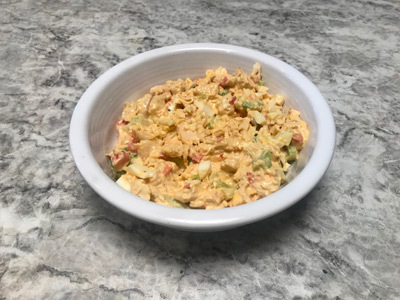 Add 2 hard-boiled eggs, peeled and chopped, 1 cup chopped celery, 1/4 cup chopped green onion, whites and tops, 2 tbsp fresh lemon juice, 3/4 tsp salt, 1/4 tsp celery seed, 1/8 ground pepper, 1/4 diced green pepper (about 2 tbsp), 3/4 cup mayonnaise, 1/2 tsp paprika. Mix ingredients thoroughly, then cover and chill for 2 hours. Garnish with fresh parsley. 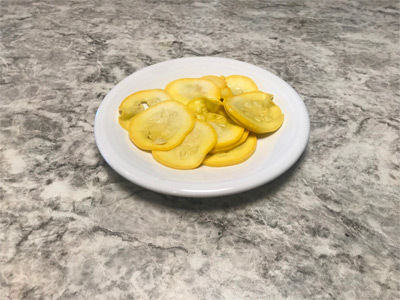 Slice summer squash across the width of the squash into very thin slices. 1/4 cup diced sweet onion, and 1/2 diced bell pepper. Add squash, onions, and bell pepper to a bowl with 2 tbsp salt, and enough cold water and ice cubes to cover. Allow to sit for 30 minutes, then rinse the vegetables in a strainer, and allow to drain. Bring 1 1/4 cup cider vinegar, 6 tbsp sugar, and 1/2 tbsp ground mustard to a boil in a saucepan, and stir to combine ingredients. Remove from heat and allow to cool for several minutes. 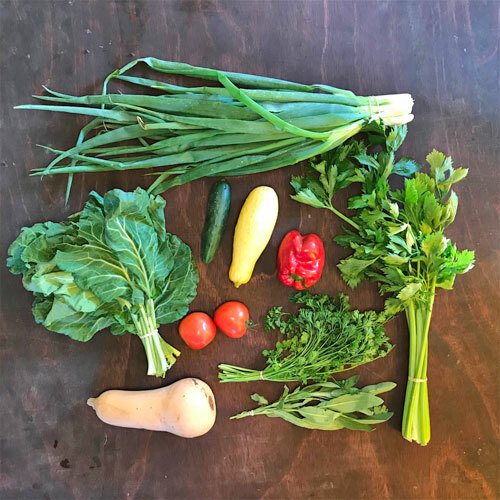 Pour mixture over vegetables and toss to combine. Cover and refrigerate until cool. Serve by removing vegetables from the brine. 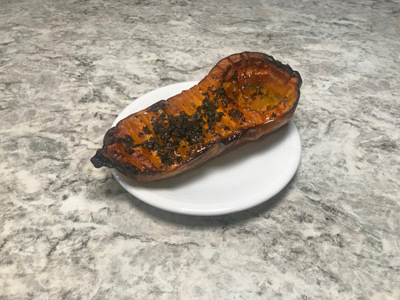 Cut squash in half and scoop out seeds and pulp from cavity. Add scores 1/2 inch deep to flesh then, between the two halves, spread 3 tbsp of cubed butter, 2 tbsp brown sugar, all sage, finely chopped, salt and pepper. Roast in oven at 400F for about 60 minutes. Cook 1/2 cup bulgar wheat or barley. 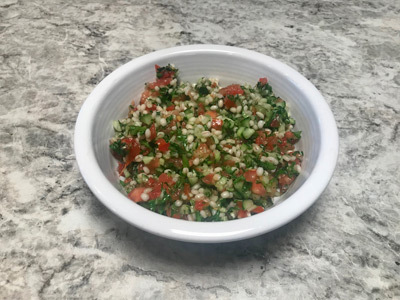 Finely dice 1 cucumber, 2 beefsteak tomatoes, with excess liquid drained off, and 1 bunch of parsley, about 3/4 cup, and 1/4 cup finely diced green onions. Add 3 tbsp olive oil, 3 tbsp lemon juice, 1/2 tsp salt, 1/4 tsp pepper. Mix ingredients thoroughly and chill before serving.